Welcome to our independent website and blog focusing on telephony technology, such as virtual hosted PBX and VoIP solutions for the consumer and the Small Medium Business. Our goal is to provide independent information – through our articles, reviews and blogs – to assist those considering obtaining a new telephone solution. Sometimes, the technological jargon and business buzzwords are confusing and it can feel like trying to negotiate a maze of similar sounding, but different technologies. Our articles and blogs aim to assist, inform, and educate whilst we strive to demystify the technology whilst clarifying the business benefit. Therefore, whether you are interested in a comprehensive feature rich PBX or a professional incoming call answering service we have articles and blogs that we hope will be of assistance to you. Here on Virtual Hosted PBX we research, analyze and document all of the available telephony solutions. There is no one technology that suits all types of small business, every business’s operational requirements and budgets will differ. So with that in mind we consider how a technology’s features and functions will map and bring benefit and value and to which type of business. We gather and relate this information through our experience and knowledge of small businesses, their operational requirements and the financial constraints under which they operate. Grasshopper is a virtual telephone system available in the USA and the UK that transforms the customers’ perception of small businesses by portraying them as fortune 500 companies by providing a professional PBX incoming call answering and forwarding service. The obvious advantage of Grasshopper is that subscribers use their own mobiles and landlines to receive the forwarded calls. This is because Grasshopper is a virtual telephone system aimed at the entrepreneur and small business, but it is a service with a difference. How is the Grasshopper Service Different? What makes Grasshopper different is that although it is a virtual phone system, it is not as you might initially suspect VoIP it is actually an overlay on the plain old telephone service network (POTS). Grasshopper uses the traditional telephone network to redirect calls from an incoming number – which it supplies – to the subscribers mobile or work number. The Grasshopper virtual phone service allows a subscriber to pick a local, 0-800 or Toll free real telephone number, which will serve as the incoming call number. Grasshopper will auto-answer all calls to this number greeting the caller with a custom message and a menu such as press 1 for sale, 2 for support etc. Upon selection of a preference, Grasshopper will forward the call to the subscriber’s mobile (cell) or landline. Grasshopper appears to offer a good solution for the small business that operates from their mobile phones or landlines. In the Virtual Hosting PBX review, we will look deeper into how Grasshopper works, its many other features, its competitors and why it is a benefit for the SMB. We will consider the strengths and weaknesses of the technology and the solution, who will benefit from this service and who should avoid it. RingCentral’s declares it to be the all-inclusive phone system and it is a market leader in virtual telephone services with over 300,000 customers worldwide. Their products, which are cloud based phone systems, deliver voice, text, fax, audio conferencing along with HD video meetings. By being based in the cloud RingCentral take the administrative and maintenance burden away from the client. The cloud provides high availability, redundancy and reliability, which are key performance metrics when measuring any business critical system. 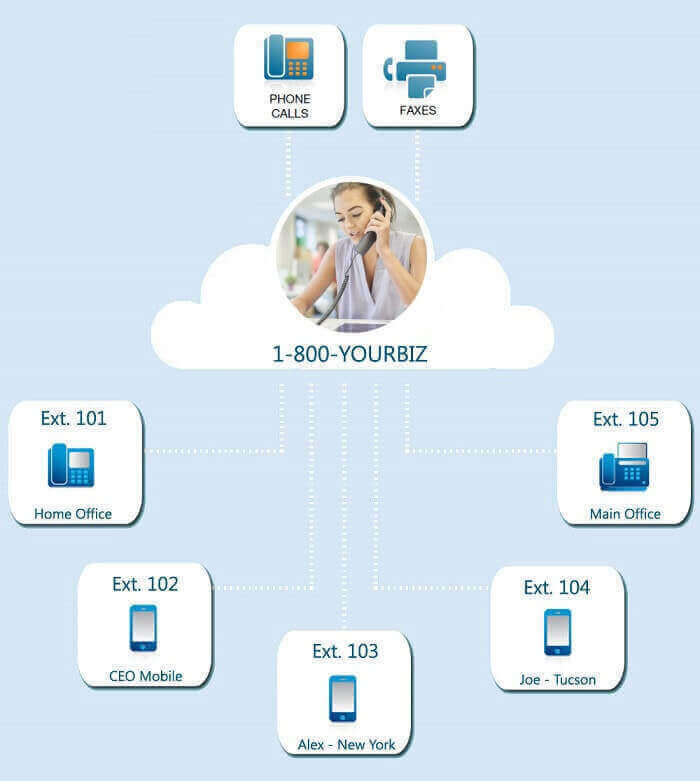 RingCentral don’t just provide a cloud based virtual phone system they offer both an all-encompassing IP PBX service with all the features you would expect from an enterprise-class PBX. However, that might be overkill for most small businesses or startups. Therefore, to address that market niche they provide an incoming call answering virtual service that provides all the inbound call features of RingCentral’s full PBX offering. RingCentral’s products are flexible and have business mobility initiatives in mind so clients can use a variety of IP capable phones, including softphones, mobiles and tablets. Support for mobility and BYOD (bring your own device) is becoming increasingly essential in today’s business environment as employees are using their own devices to manage calls and business related work. To support this initiative, RingCentral has mobile applications for iPad, iPhone and Android mobile devices. Internet Fax and business SMS are other features rarely addressed comprehensively in most PBX solutions. However, with RingCentral faxes can be sent from any device even with attachments from cloud storage such as Dropbox or Google Drive. Similarly, RingCentral supports sending text messages on even mobile devices via SMS that originate from your business number. Professional or Office, What’s it to be? It appears that RingCentral has all the bases covered when considering desirable features in a virtual phone system. That in itself is not unusual in a hosted PBX provider what is unusual is that they offer two completely separate voice products Professional and Office aimed at different business requirements. So which one will match your needs? Limited Promotion: Click to get a $50 Amazon Gift Card! Phone.com is a virtual PBX phone system aimed at the small business market. It is a cloud based phone service, which is an ideal solution for small business and start-ups. Phone.com is a hosted service that offers four products; Business, Virtual Business, Residential and Mobile Office. Phone.com have taken care to tailor these offerings to the specific customer requirements of small office home office (SoHo) and small medium business (SMB) whilst still catering for the residential customer and the mobile entrepreneur. Phone.com has services to cater for residential customers using a standard telephone so that they to can benefit from the same virtual hosted features of an IP/PBX. Their mobile solution is an application that works on iPhone, Android and Blackberry. Phone.com tailors its price plans towards easy billing there are two options; pay per call, or unlimited usage. There is a fixed monthly fee, which comes with 100 minutes and no contract. This is a crowded market place with several quality competitors, with similar products all boasting the same 40 + features. In this market, you need to have something that differentiates your product from the crowd. So what differentiates Phone.com from the competition? MightyCall is a relative newcomer on the virtual telephone scene, as a Seattle base telecom company that started life as Infratel in 1999 but it has already around 20,000 users. In addition MightyCall comes with a rich set of features and at an accommodating price so it should be attractive to many small businesses. However competition is strong in the virtual telephone business and with competitors such as Grasshopper and Phone.com the MightyCall service will need to be robust as well as cost effective. At this end of the SoHo (small office home office) and entrepreneur market space price and features are very important but so is quality of service and reliability, which are the hallmarks of the Grasshopper virtual telephone service. Therefore we will look at the services MightyCall offers in the way of business telephone numbers such as local, toll free or vanity numbers and the way they structure their business model for example is it priced by features or by bundled minutes or a mixture of both. These are all important issues in the virtual telephone service industry as it can determine how easily it is to join and how cheap it will be to run the service. We will also consider some of the options that make MightyCall a viable alternative to some of the well established competitors and some of its relative failings which will need to be addressed if it is to find a place in the virtual telephone service marketplace. So in this review we will take an in-depth look into the MightyCall service and consider the features functions and importantly their price plans. Phonepower is one of the largest VoIP residential service providers covering continental USA and Canada, and have their corporate headquarters in Winnetka CA. They have been operational since 2005 and have experienced impressive growth in the each of the years up to now. Phonepower however though well established and with a reputable reputation in the residential VoIP market also has service plans and support for small medium businesses and even enterprise class organizations and contact centers. Phonepower residential and small business service plans range from very low cost metered outbound calls, with unlimited free incoming calls, up to, unlimited incoming/outgoing services with virtual numbers and cloned second lines. These service plans require no additional client hardware, phonepower supplies an adapter into which you connect your existing analogue phone (standard telephone). The only prerequisite is that the customer has a high-speed Internet connection. Phonepower has business class services that can scale from single line business accounts up to support even enterprise-class contact centers with multi-location hosted PBXs. To support these business requirements, phonepower boasts of an impressive mixture of features, pricing and quality customer care. However, the requirements and service levels for business are not the same as with residential, so how does phonepower handle this new step up in service level? In this review, we will look at phonepower’s business centric services from the perspective of a small medium business to see how they deliver on the key performance indicators, quality of service, features/pricing, technical support, and most importantly reliability and availability. Why should I upgrade my traditional phone system to a hosted cloud service provider?, what are some of the business reasons I should consider? There are several key points you should consider when evaluating upgrading your existing telephone system to a hosted cloud service. Perhaps some of the most important business justifications are down to cost and efficiency. With a cloud hosted solution the business saves on maintenance and service costs while also making savings on calls. Also the business efficiency improves because hosted cloud services enables employees to easily access the business telephone system from anywhere there is an internet connection. Similarly, most modern businesses will require their phone system to be integrated with their customer data applications such as CRM (Customer Relational Management) this is very difficult with a traditional phone system but with most cloud based providers this feature is readily available. What are the options I have regards upgrading my traditional telephone service? There are several options, one is to simply buy additional phone lines or a trunk line from a local Telco. This is okay but rather inconvenient as there will be several business numbers to manage and advertise efficiently, otherwise you could be forever transferring calls. Another more efficient way is to purchase or rent an on premises PBX this is very similar to the traditional system however you will still require that trunk line from the Telco to support multiple simultaneous calls but at least then you have one number and can easily manage the internal call routing to the correct extension via the PBX. A third option is to deploy an on-premises IP PBX which is open source (free) software on a local server. This requires a lot of technical knowledge but is a cheap effective option if the in-house skills are already there. Finally, there is the option to outsource the management of your phone service to a IP PBX cloud provider. A host IP PBX has the advantages of IP PBX but without the skills and knowledge requirements t run the software and servers. What cost savings can my business make going with a hosted PBX service over a traditional service or an on-premise IP PBX? The biggest initial saving in costs is the capital expenditure that is saved in buying an on-premises PBX. This is also true even if you decide on a software IP PBX, such as Asterix or Trixbox as you will not need to buy a server. There is also going to be significant savings regarding the ongoing maintenance and administration overheads required to support an on-premises IP PBX. Additionally there are often significant savings with regards local, long distance and international call rates, though these can differ between vendors but generally these companies make significant savings due to purchasing minutes in large scale which is savings they can pass on to their customers. My business has several locations and some employees work from home, what sort of telephone system would best suit my needs? A cloud hosted PBX telephone system is ideal for a multi-premises business with home based employees because the system is accessible from any internet enabled device. However, the major benefit is that each location can be bridged to form a single network which would make inter-site calls free s they are considered to be internal extensions. Similarly, home used can simply be treated as an extension or a department and their inter-department calls will also be free. What are some of the distinguishing features and functions that a cloud hosted PBX service can provide that my tradition telephone system cannot? Mobility is probably the best example of how employees can benefit from a cloud based hosted service as they can access and be contacted anywhere there is an internet service. Another favorite is find-me-follow-me which is a call transfer option that will ring a list of telephones in sequence or simultaneously till they get an answer. In this way an employee can configure their mobiles, home telephone, VoIP phone, or SIP softphone on their tablet or mobile, whatever extension they wish so that they can always be contacted. Another favorite is web based system administration and user configuration as now system updates and changes can be done from anywhere. Moreover, cheap or even free local, long distance and even international calls are possible with some careful system planning. My business requires my staff to be mobile and work from their mobile phones, is there a cloud based service that fulfills that need? Dependent on the size of the business, and the number of employees, the best solution is often to look at a virtual telephone service rather than a full cloud hosted PBX. Some virtual telephone services are specifically designed to meet the needs of a mobile workforce, an example is Grasshopper, which provides a real business number and call answering services and transfers calls directly to a mobile phone. The huge advantage of these virtual telephone services is that the business has one business number to advertise and it will be answered every time, there will be no missed calls. Any call than cannot be forwarded to an employee’s mobile for example it may be busy or out of hours will be forwarded to voice mail. The caller will always be greeted with a professional answering service and be offered a menu of names, extensions or departments this gives the impression of a much larger company. Furthermore, employees no longer have to give out their private mobile numbers which keeps business and private calls separate. What is a virtual telephone service and will it suit my needs? A virtual telephone system was typically an inbound answering service which used an auto-attendant to answer all inbound calls to a business number and then transfer the calls to either a mobile phone or a landline telephone. Virtual telephone services therefore are well suited to small medium businesses that do not have an office and have mobile employees or staff that work from their homes. What value does a virtual telephone service provide, other than as an answering service? Customer calls are always directed via the business number so the company stays in control of their business communications with the customer. This is important as the customer doesn’t call an employee directly but always passes through the company telephone system. This means the relationship remains between the company and the customer, and not between the customer and the employee. It also means there are call records and voicemail services which are centralized so the company stays in control of their communications. Virtual telephone services are very flexible and efficient and perfectly suited to mobile entrepreneurs, startups and home businesses that require a solution based upon employees mobile or landline phones. Why should I choose a hosted cloud PBX over a virtual telephone service? The choice is down to the range of services, features and functions. A hosted PBX provides incoming and outgoing call management and typically cheap outbound calls or free network minutes per extension. The major difference is employee outbound calls are managed and controlled on a cost basis. There are also many additional inbound functions such as advanced call queuing and distributions some hosted PBX even has advanced call/contact center features. Additionally, PBX’s are designed to support businesses of all sizes so have many features and functions that would previously only be found in large enterprises. These include, unified communication support for voice, video, chat, email and text. There is also a feature in most PBX’s for integration with popular business software such as Outlook, CRM and even some financial packages. Combined, hosted PBX services can provide a fully scalable business solution for SMB and even enterprise clients. How does a virtual phone system differ from a hosted cloud service? The difference between a virtual telephone service and a cloud hosted PBX is generally a virtual system is inbound while a PBX service handles both inbound and outbound calls. Cloud hosted PBX also as the name suggests provide a full range of PBX features and functions whereas a virtual service features are rather more limited and focused on inbound calls. Are VoIP and hosted cloud PBX systems reliable and do they provide good voice quality? VoIP in the early days of the millennium was very unreliable and often suffered from poor voice quality. However the internet has improved vastly in the last 15 years and bandwidth has increased to levels that easily support voice over the internet even without complex voice compression algorithms. The result is that hosted PBX service providers can confidently deliver HD (high definition) voice to the customer as well as boast reliability figures of 99.99% per annum and higher for service reliability and system availability. Are there any limitations to a virtual telephone service I should be aware off? There are some limitations however and this is especially true with regards outbound calls as the call would come from the employee’s mobile or landline. However most virtual phone solutions today provide mobile apps which enable outbound calls to be made from a mobile phone using the business number as the caller ID. This is an important feature and one you should check for when evaluating a virtual telephone service. I have decided to upgrade my business telephone solution to a hosted cloud PBX service, what are the key elements that I should look for when comparing services? Many service providers supply their services based on a couple of business models. One business model is to provide an all in service plan with all features and functions at three service plan levels dependent on usage or the number of free minutes that are part of the plan. These plans typically will only differ with regards the numbers of free call minutes per extension or seat as they often call them. This is quite a good method for the SMB as you can select the best usage plan to suite each user’s requirements. The other business model that is prevalent is the unlimited calls model, whereby each extension has unlimited free call minutes. These are generally going to be more expensive and the service plans will often differ due to which features and functions are required. A third model is a hybrid system where service plans offered are a mixture, a compromise on features/functions and free minutes. There is no preferred service plan it all is dependent on your businesses requirements. What do hosted PBX service providers mean when they refer to unlimited extensions in a service plan? Typically with hosted PBX service providers they are referring to the number of free calls per extension. However, you need to check what regions these free minutes cover, typically it is only in the US and Canada. However companies covering the EU and UK will also provide unlimited free calls. It is important to check because calls that are not covered under the unlimited terms can be expensive. One further caveat to bear in mind is that with virtual telephone services (inbound only) the unlimited term refers not to free call minutes but the number of phones that you can attach to the business number. My service provider offers plans with extensions starting with 3,000 free minutes, is this sufficient for a low usage extension? For extensions that only make internal calls to other departments, or for employees that do not make or receive many external calls this is often sufficient. It is important to note though that IP PBX service providers and virtual telephone providers bill for both incoming and outgoing calls. Therefore you have to consider calls being received as well and being made when calculating for required minutes. Another caveat is that high usage extensions are often best being unlimited to prevent where possible going over the allotted free calls limit. Many service providers’ charges are quite hefty once the free call limit is exceeded so always check in advance what the extra call minute rates are charged at. My hosted PBX service provider is offering unlimited calls on all service plans, doe this mean all my calls are free and I will not be billed for calls? This is an important point, unlimited often doesn’t actually mean you can make or receive limitless calls. What the hosted PBX service providers do is operate a Fair Usage Policy which will be buried away in the Terms and Conditions, but you must read the T&C to discover what the fair usage is and what the penalties are for exceeding the limits. Another point to note is that even though many hosted PBX service providers offer the features and functionality to run a contact center they do not allow extensions within a contact center to be on unlimited service plans. This is because of the expected high volumes of calls, so again check the Terms and Conditions. Does hosted cloud PBX and virtual telephone services provide emergency 911 and directory services calls? Many cloud based service providers now support enhanced E911 emergency calls but some do not, so you need to check in their feature lists that it is included. Directory services, such as 411 is also sometimes an included feature and comes under free minutes but not always. Some service providers charge extra rates for directory services, so again read the feature lists and the Terms and Conditions. Will my existing telephones work on a hosted cloud system? To some extend you can as the PBX can forward calls to any telephone, whether that is a landline or mobile phone. However to get full advantage of many of the additional IP features such as quick dial, do not disturb, voice and video conferencing and multi-line capabilities amongst others you will need to invest in IP enabled phones that are either Ethernet or Wi-Fi capable. Apart from IP phones is there anything else I will need to install in the office? Typically the IP phones will just share the existing data network that connects the office PCs. However, in larger offices it might be beneficial to run a separate LAN or at least configure a dedicated VLAN to support the voice traffic. In some circumstances it may be best to buy an Ethernet switch that supports PoE (Power over Ethernet) so that you do not need a power adapter for every phone. In small offices, the existing network and a VLAN will do as the phone and computer are sharing a single Ethernet cable but again a PoE switch can make life easier and keep things tidier. Unfortunately, in many small offices and even larger ones Wi-Fi has become the ubiquitous form of network connectivity and here there is a problem because IP phones rarely come with Wi-Fi modules unless they are top of the range models. Therefore it will be necessary to either run Ethernet cables to a PoE switch or buy the expensive Wi-Fi enabled IP phones. How will Fax work on a hosted cloud system and is it secure? Fax is one of the drawbacks of cloud based PBX systems as many companies rely heavily on the confidentiality and reliability of the traditional fax systems. As a result some companies that have robust security requirements such as Law firms may still keep a spare telephone line for their fax machine. Many hosted PBX cloud service providers have internet and online fax solutions but none match the security and reliability of the traditional PSTN fax system. This is simply because most require the document to be faxed to be copied and stored in the cloud o the provider’s servers and if high confidentiality is a requirement then that isn’t suitable for security conscious companies. There are many hosted service providers on the market, is there a way to narrow my search to only those that meet my criteria? Yes on this site there is a service plan and vendor comparison tool which will take as input your basic requirements and provide as output a list of only those vendors and service plans that match your criteria. For example you can select the number of employees (extensions) you will require, some pertinent features and budgetary details and the tool will filter the results to match those requirements. The basic comparison tool is found here https://www.virtualhostedpbx.net/comparison You can find advanced comparison tools each configured for a particular category such as entrepreneur/home office, SMB (small medium business), Large Business and SME (small medium enterprise). Buying a telephone solution isn’t just about features and price, many features that are proudly listed in vendor’s brochures will be of no use to most businesses, even if they do manage to figure out what they actual do. It’s about obtaining the system and the features that you require – preferably only those that you require – and at the price that fits the budget. However, here is another business conundrum where we aim to assist – total cost of ownership (TCO). A common misconception is that cloud based hosted services are cheaper than having an on-premises server. The logic being there is no upfront investment, or maintenance only monthly subscriptions. However, that is not necessarily the case sometime long-term contracts can be costly and be required annually in advance, keeping you locked in to the service. Therefore, we consider the necessary due diligence that should be performed, before you decide on a technology or a solution. Moreover, on Virtual Hosted PBX we aim to merge our business and technology, research and experience to guide you the consumer or small business through the sometimes deliberately impenetrable fog of terminology and buzzwords. You can be sure there will be many obstacles in the way when negotiating the path to acquiring a suitable business or home telephony solution. Here at Virtual Hosted PBX we strive to cast some light upon the path, so that you the consumer can make informed decisions when purchasing the solution that best fits your requirements and brings benefit and value to your business at an affordable price.